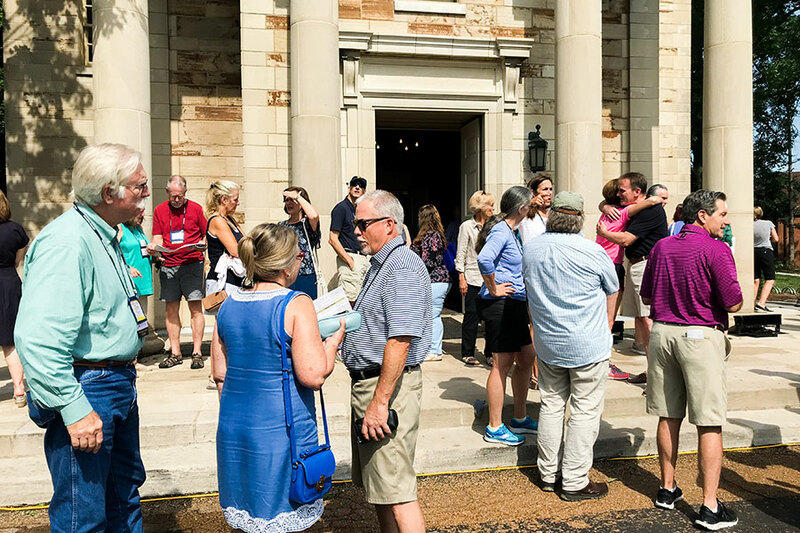 Alumni shared memories and created new ones at the 2018 College Reunion this summer. The event drew over 600 people from as far away as KwaZulu-Natal, South Africa. Along with a variety of talks, classes, and entertainment, attendees took advantage of numerous activities, such as tennis, golf, and stargazing at the observatory. Campus tours showed off the new learning spaces—especially the fully renovated Voney Art Center and the in-progress renovation of Morey Field House (expected to open in late 2019). The first-ever Alumni Games took place as well, including a 3K run, beach volleyball matches, a homerun derby, and several other events, resulting in lots of friendly team and individual competitions—and even more fun. Many alums also performed in the Alumni Choir. College President Dr. Jolanda Westerhof (US’77, C’82) and Chief Executive Marshall Ingwerson (C’79) shared updates, outlining events and progress at the College. The David K. Andrews Alumni Award (affectionately known as the DKA award) was presented to Joanne Leedom-Ackerman (C’68), a novelist, short story writer, and journalist. She is vice president emeritus and former international secretary of PEN International, a worldwide organization of writers, as well as former chair of PEN’s International Writers in Prison Committee. A video in which Leedom-Ackerman shared thoughts on the value of a Principia College education preceded the presentation of the award. In addition, Rob Ostenberg (US’65, C’69), a decorated veteran who retired from the Army as a two-star general, presented lapel pins to Vietnam-era veterans (or a family member) in honor of their service. The 50th Reunioners (Classes of 1968 and 1969) arrived a day early and enjoyed several events just for them, including a cruise aboard the Becky Thatcher riverboat and a concert by Angie Keilhauer, known for her success on the hit television show The Voice. Then on Saturday evening, they presented a special gift to Principia College—just over $804,000! The gift will support the engineering program and establish an endowment to fund student internships. The total amount of 50th Reunion giving (not all of which went toward the class gift) was the highest ever raised for a reunion—$1,053,413—and gifts continue to come in! During that same evening event, the 25th Reunion Classes of 1993 and 1994 presented their gift—over $252,000 to support a variety of funds, including the Annual Fund. Everyone present was deeply touched by the gratitude and enthusiasm for Principia represented by such generous gifts. Enjoy a Reunion video and photos.